What if I were to tell you that much of the way that we have come to remember Gettysburg was shaped not by the men who fought there, but by an artist who never even saw the battle? John Bachelder & Wife, 1890. John Badger Bachelder – a portrait and landscape painter from New Hampshire – not only had a significant impact on the way we understand the battle proper, he also had a profound impact on the way that the battlefield itself was preserved and interpreted. 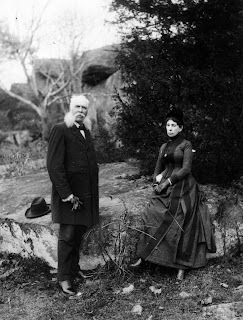 And for those who express annoyance at Gettysburg being “the world’s largest collection of outdoor sculpture,” John Bachelder shoulders a large portion of the blame, since he served as Superintendent of Tablets and Legends for the Gettysburg Battlefield Memorial Association from 1883-1887. Bachelder’s Civil War journey began when he made a covenant with himself to, as he put it, “wait for the great battle which would naturally decide the contest; study it’s topography on the field and learn its details from the actors themselves, and eventually prepare its written and illustrated history.” His opportunity came when he learned of the contest at Gettysburg, and he arrived on the field just days after it had concluded. After speaking with wounded soldiers, jotting down some notes, and making sketches of the terrain, Bachelder caught up with the Army of the Potomac in Virginia and received permission form Gen. Meade to interview the survivors of the battle over the winter of 1863-1864. I spent the entire winter…visiting every Regiment, holding conversations with its officers and with privates in many cases, submitted to them the drawings I had made of the Field and had them corroborate and complete the position of the troops upon it. 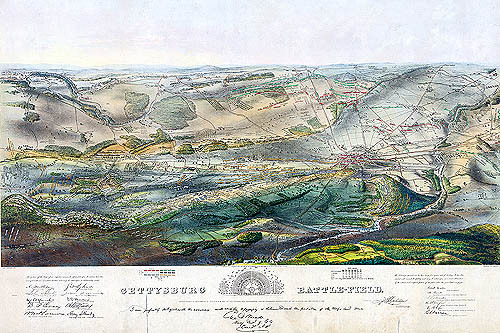 In 1865 he published his “Gettysburg Battle-field: Battle fought at Gettysburg, Pa., July 1st, 2d & 3d, 1863 by the Federal and Confederate armies, commanded respectively by Genl. G. G. Meade and Genl. Robert E. Lee,” which became a great success. 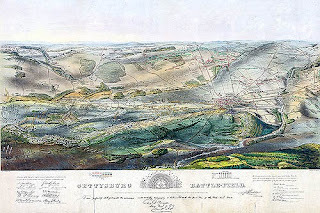 Crowning himself the “official historian” of the Battle of Gettysburg, Bachelder’s obsession with the battle grew after the war when he collected as many firsthand accounts from the participants of the battle as possible. He even used his influence to bring the surviving veterans back to Gettysburg to walk the battlefield with him and give their explanations of the ebb and flow of the battle. While the veterans may not have realized it, their understanding of the battle was actually molded by these tours: Bachelder would lead the groups around, explain what happened on that particular part of the field, and then have the veterans tell him how their individual stories fit into his overarching narrative. Thus, many old soldiers were hoodwinked into believing that Bachelder’s knowledge of the battle was greater than their own. Without any formal training or experience, the painter sought to sort through the problems inherent in dealing with imperfect human memory and then tried to combine an enormous collection of often conflicting accounts into a single history. By this time, however, Bachelder was so convinced of his own expertise that he began to flex his intellectual muscle to the point where people became irritated at his impudence. In 1885, Winfield Scott Hancock had to write Bachelder and tell him that he got the location of Hancock’s wounding during Pickett’s Charge wrong – even though Bachelder and Hancock had visited the spot together three years after the battle. Bachelder thought his knowledge of the affair trumped Hancock’s, which drew the ire of a man who was not to be trifled with. When Bachelder completed his 8-volume history of the battle there was an outcry not only from the veterans, but also from some of the government officials who felt they didn't get their money’s worth. Southerners especially felt jilted, since the coverage of battle was skewed disproportionately with Union accounts (one reason for this being that Bachelder was not given access to the Army of Northern Virginia during the winter of 1863 – 1864.) The War Department paid Bachelder the full $50,000, but his manuscript went unpublished. Bachelder would continue to play an important role in the expansion of the Gettysburg battlefield until his death in 1894. Thus, it really is difficult to play down the influence that John B. Bachelder has had upon the way we understand and compartmentalize the Battle of Gettysburg. Something tells me that, at this very moment, his soul is marching on as the commemoration surrounding the battle’s most important day – July 2, 1863 – continues. Don't be too hard on old John, without him Gettysburg Park would be about 5 acres of picked over potholes and the rest would be covered with asphalt. And we would not have the Gettysburg address.